DoorDash is a food delivery app available in the US and Canada that allows anyone with a vehicle to become an on-demand delivery driver. Customers order food through the DoorDash app, and nearby DoorDash drivers pick up and deliver the food. Delivering for DoorDash is an appealing job because it is easy to get hired, the pay is around $10–$15/hour, and you can set your own hours. To get a job as a DoorDash driver, you’ll have to meet the requirements outlined in this article. Many people will qualify for this job, so it’s a great option if you’re looking for work right now. Tip: Sign up to drive with DoorDash with my link to be eligible for the best promotion in your area. Not all cities offer promotions. I’m affiliated with DoorDash, so I may receive a commission if you sign up using my link. Where can you drive for DoorDash? DoorDash is currently available in many cities in the US and a few major cities in Canada. Click here to see list of all DoorDash markets in the US. DoorDash in Los Angeles and San Francisco – Best bonuses! DoorDash wants to add as many new Dashers as they can find in Los Angeles and San Francisco, and they’ve increased the new-Dasher bonus in LA and SF to all time highs. If you’re thinking about working for DoorDash and you’re in LA, SF, it’s worth a try. If you’re thinking about starting with DoorDash, it’s a lot faster if you apply online then head to a DoorDash office to complete your application and pick up the gear you need to do the job. Need to visit an DoorDash office in person? Vehicle requirements are minimal for DoorDash: Any working vehicle qualifies. You can also choose deliver with motorcycles, scooters, or bicycles in some markets. Can you deliver on a bicycle? Some larger urban markets allow delivery partners to use a bicycle or scooter to perform deliveries. If you don’t have access to a vehicle, it’s worth checking to see if you can deliver for DoorDash on a bike or scooter. To find out if you can deliver for DoorDash on a bicycle in your area, head to dasherhelp.doordash.com and search for ‘bicycle.’ Scan the search results for information about your city. You can also begin begin the DoorDash application and check to see if delivering on a bicycle is listed as an option in the early steps of the application. DoorDash performs a background screening on all applicants by contracting a third-party background check company. When you apply online, you will be asked to consent to the background screening. You will need to provide your social security number to begin the screening process. Considers arrests or criminal accusations within the past 7 years. 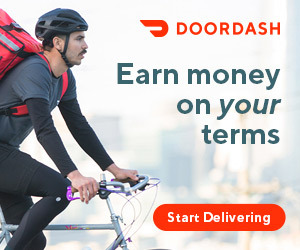 DoorDash delivery drivers typically earn around $8 – $15/hour. DoorDash pays drivers according to a formula: $1 + ‘pay boost’ + 100% of tips. Before you accept a delivery, a guaranteed minimum payout amount will be displayed. If ‘$1 + your tip‘ doesn’t reach the guaranteed payout, DoorDash supplements the delivery with a ‘pay boost’ to make your payment meet the guaranteed minimum. The guaranteed minimum payout is a calculation of variables like difficulty of the order, distance you’ll have to drive, size of the order, and other factors. DoorDash offers other payment features to incentivize delivery partners to drive during busy times and peak hours. Busy Pay is a bonus offered in addition to the guaranteed minimum during times of high demand. You are paid once weekly via direct deposit to a bank account. DoorDash drivers are 1099 independent contractors, so you will have to pay for your own gas, insurance, and other expenses you run into along the way. Minimize your taxes at the end of the year by keeping track of all mileage during your shift using an app like Stride Tax. DoorDash drivers perform on-demand delivery requests that are organized by the DoorDash app. Drivers schedule shifts in advance or can drop into open shift slots if available. At the start of the shift, you sign into the DoorDash app and wait to receive orders. Orders contain detailed information about the location of the restaurant and pickup instructions. After you accept a delivery request, navigate to the restaurant and pick up the order using the information given to you inside the app. After picking up the order, the DoorDash app will direct you to the customer and give you any special instructions you’ll need to complete the delivery. You will be able to contact the customer if you need any more info about directions, parking, or gate access codes. Some markets require that you visit an office to complete your application and complete a brief in-person or online orientation that helps familiarize you with the app and with the job you’ll be doing. The online orientation is a brief series of videos, and a quiz at the end. The in-person orientation only lasts about 30 minutes. You may be asked to fill out a W-9 tax form and a consent form for the background check. If you pass the background screening, you will be mailed an activation kit that contains and insulated delivery bag and other small items you will need to perform deliveries. Should you be a delivery driver for Postmates and DoorDash? What’s it like driving for Deliv? My status says “consider” does that mean I did not pass? It could mean that. Do you have issues on your background or driving record? If so, there’s a chance you’ll be rejected. I spend part of the year in California and part in Oregon. I am an Oregon resident. Is it possible to work for DoorDash in California with an Oregon address? I have tried filling out the application but it won’t allow me to use my legal address (Oregon). It says that DoorDash doesn’t deliver where my Oregon address is, But I want to work when I am in California during the winter season. Can you please help me? I have received your bag and debit card. Were do I go for the online to see the orientation videos? Yes they did. They said it’s available in some cities.